below its crust, the Earth is broken into tectonic plates. When these plates shift, earthquakes happen, volcanoes erupt and mountains are formed. Regions where such plate movement have taken place are good conductors of current. They also indicate the presence of water, said a team of geologists. 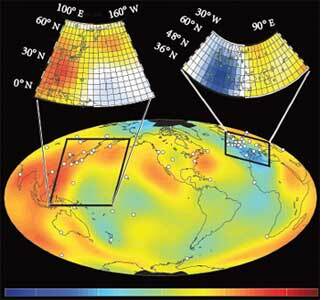 For the first time, the team mapped the Earth's ability to conduct current on a three-dimensional scale. This map is crucial in understanding Earth's composition. How much water is present under its surface is still a mystery. It is also a start towards the construction of models that identify regions at a high risk of geological hazards. Geologists from the Oregon State University, usa, collected data from 59 locations around the world and measured the conductivity of those places using Earth models.The team found high conductivity where downward movement of tectonic plates (subduction) had taken place. Some of these areas were in Japan and eastern China. The evidence from the map ties in with the geological record that shows downward tectonic plate movement had taken place in these areas. Most evidence suggests subducting rocks initially hold water within their minerals, but that water is released as the rocks heat up, explained the researchers. Hence the plates should be much colder than the surrounding mantle and less conductive, accordingly. The models, however, indicated the opposite. The team put two and two together and said the reason was water. Rocks from the seabed containing dissolved water move downwards during subduction. "These plates take time to equilibrate with mantle temperatures so it is possible that water persists within these cooler slabs even if mantle temperatures surrounding them are high," said marine geologist Adam Schultz, and an author of the paper. Conductivity of minerals in the mantle increases by the free protons that the hydrogen from the water molecules supplies. Higher the proton supply, higher the mantle's conductivity. The next step is to use newly available data from ground observatories and satellites to create a model quantifying the water locked inside the mineral-bearing rocks of the mantle. Other than identifying regions of future quakes, it could also pinpoint locations that can be harnessed for geothermal power generation, said Schultz. The August 20 issue of Nature reported the study.